If you’re looking for a way to refinance student loans, or get another kind of loan, you should know a lending company called SoFi is quickly making its mark in the online loan industry. While I’m a huge advocate of being debt free, I also realize that there are times you have loans that need to be refinanced for better terms so you can get out of debt more quickly. It seems SoFi loans (social financing) can help with that. After researching SoFi reviews, I’m sharing the highlights of what you need to know. Just about everything, from refinancing student loans, to medical bills, mortgages, and more. They seem best known for their student loan refinancing. 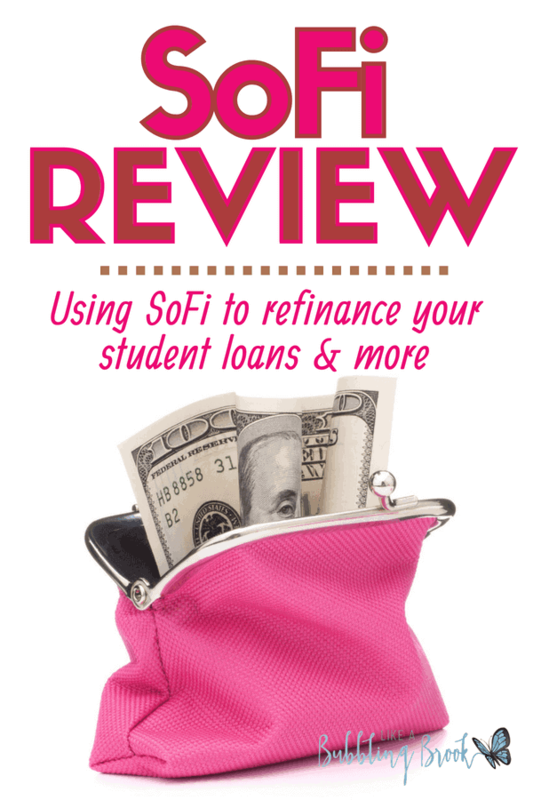 *Tip: Regarding borrowers who refinance their student loans, SoFi says they’ve saved them an average of $15,000 each and given them shorter loan terms. How are their rates and terms? Competitive, although you do need decent credit to get approved. It seems their lowest credit score they’ll approve is around 680. According to SoFi, most important in determining your creditworthiness is how much cash flow you have, and how much of your income is left after expenses. They want applicants with good credit, good jobs, and good income. If you qualify, you may get approved in as little as two minutes, and it takes about seven days to receive your funds after you’re approved. You’ll get a great rate and some pretty cool perks. It’s kind of like being in an elite club. How do you apply for a SoFi loan? You can apply on SoFi’s website (<–this link will also get you $100 cash bonus when your loan is funded) by setting up a simple account and then entering information about your education, employment, and income. Please note: I have not personally used SoFi loans since we’re already debt free. I’ve simply tried to research what might be helpful to you as you seek to become debt free, too. Because of that, I’ve sought out an affiliate relationship with SoFi, and will get a finder’s fee from them if you apply and secure a loan with them. Thanks for using products and partners we recommend!